Protesting NYS Gov Cuomo in his hometown of Mt. Kisco, NY. WESPAC was the anchor organization for this protest organized by the Freedom to Boycott Coalition of NYS of which WESPAC is a member. July 6, 2016. Photo courtesy of Pauline Park. First, we would like to thank you very much for your support of WESPAC over the past year. The last few years have been extremely important and also challenging times for our movements. WESPAC continues to play a crucial role locally and beyond. Over the past year, we have worked together to oppose racialized policing, supported the #BlackLivesMatter movement locally and hosted several prisoner writing sessions at our office, centrally located in downtown White Plains. 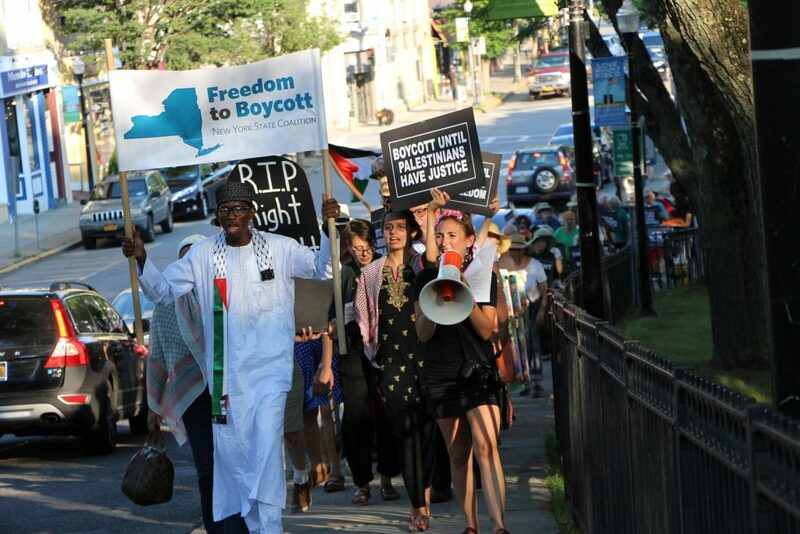 We have marched in Manhattan, Albany and Mount Kisco to demand that Governor Cuomo rescind his unconstitutional executive order blacklisting organizations that support the Boycott Divestment and Sanctions movement which calls upon Israel to respect Palestinian human rights. We have supported and marched with our immigrant rights allies to support better working conditions for New York State farmworkers, and we have marched with mothers and grandmothers from Harlem who led us to Albany to demand justice for the wrongfully incarcerated. The only way we can continue our work is with your help. Dues are $100 per person annually, or $50 for students and persons with a fixed income. We are grateful for all levels of support and no one is turned away for lack of funds. Volunteer hours are welcome in lieu of payment and can be arranged with the office. Please make your tax-deductible contribution today securely at https://wespac.org/donate/ or by check to WESPAC, 31 Mamaroneck Ave, Suite 403, White Plains, NY 10601. We are asking for all dues to be received by September 30th. WESPAC has been part of the leadership of the local campaign for police accountability in Westchester County. We have hosted film screenings and presentations on a wide range of social justice topics from military occupation and mental health, to hosting a screening of Michael Moore’s latest film “Where to Invade Next” which brought in a full house. We have also worked with young farmers and farmers of color to support a more just food system. We continue to promote Community Supported Agriculture and connect people across the county who believe fresh, local, quality produce is a human right for all. With your participation and support, we can continue to provide the space and support for high school and college students as they develop their organizing skills and become the next generation of agents for progressive social change. Recently, students have come from White Plains High School, Croton Harmon High School, Columbia University, Purchase College, Pace University, Iona College and Trinity College. We are proud of the role we continue to play as a hub for grassroots organizing with a mission to strengthen movement building in the promotion of human rights and self-determination for all communities. We need your support to make this cherished community institution stronger! Our next general meeting will take place on Monday, September 26th at 6pm at our office space located at 31 Mamaroneck Avenue (4th floor) in downtown White Plains at the intersection with Martine Avenue. Thank you for supporting our work. Together we can change the world. PS. Every tax-deductible donation you make goes to support our critical work for social justice and peace. Please like our Facebook page and follow us on Twitter!